"The sound is spectacular in whatever format you choose but the jump to Blu-ray is, as in vision, a leap forward. None of which would matter were the performances not also uniformly excellent: This is a superbly alive performance of the Britten Simple Symphony, making it sound a much more ambitiouswork than usual. A demonstration recording!" The divertimento as a musical genre dates back to the nineteenth century. Divertimenti were composed for various social occasions and were intended to be light, uncomplicated and cheerful. Such pieces were often scored for small string ensemble. Over the years this effortless, elegant form has appeared in many different musical styles and, to a large extent, set the standard for the virtuosic chamber music we know today. A number of the most prominent composers of our age have engaged with this most fascinating musical style and have contributed to its further refinement as a chamber-symphonic showpiece. The Trondheim Soloists' artistic director is Øyvind Gimse, assisted in DIVERTIMENTI by alternating concertmasters Geir Inge Lotsberg and Anders Kjellberg Nilsson. 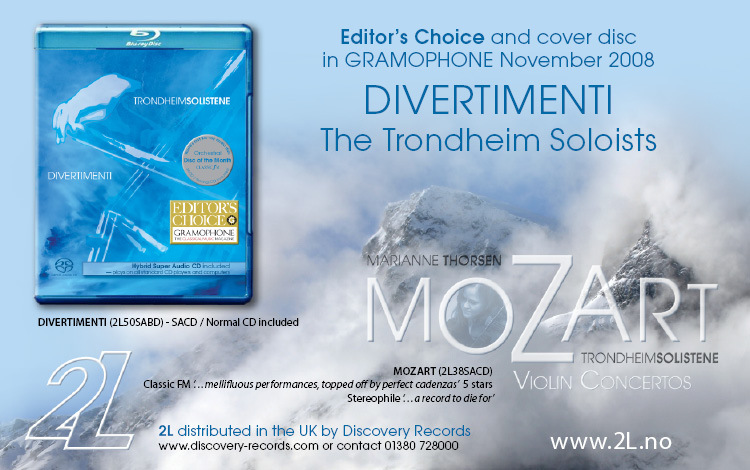 Gramophone Magazine Includes Free SACD Disc - The November issue of Gramophone - the leading English language print publication reviewing classical recordings - will have a SACD hybrid sampler disc affixed to the front cover, assembled by 12 different SACD labels dedicated to the format’s survival. There will also be two pages inside further promoting the format plus a contest to win a SACD/universal player. 52,000 of the SACDs have been pressed for this promotion, and Gramophone will be reviewing SACDs in a special section from now on.